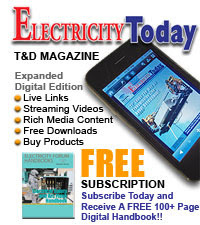 In the control systems considered uptill now, it is considered that the disturbance has affected the output adversely. Such an output is measured and compared with the reference input to generate an error. This error is fed to the controller which is successively operating the system to correct the output. Thus such system in which the effect of the disturbance must show up in the error before the controller can take proper corrective action are called feedback systems. If the disturbance is measurable, then the signal can be added to the controller input to modify the actuating signal. Thus, a corrective action is initiated without waiting for the effect of the disturbance to show up in the output i.e. cumulatively in the error. Thus the undesired effects of measurable disturbances by approximately compensating for them before they effect the output. This is much more advantageous as in normal feedback system the corrective action starts only after the output has been affected. Note : Such systems I which such corrective action is taken before disturbance affect the output are called feed forward system. 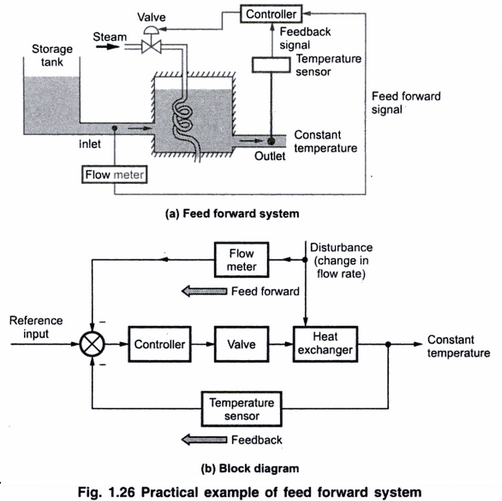 A block diagram with feed forward concept is shown in the Fig.1. ,i) In some systems, the disturbance may not be measurable. ii) The feed forward compensating is an open loop technique and if actuator transfer function is not known accurately, then such compensating cannot be achieved. In a particular process control industry, it is necessary to maintain the temperature of a molten metal constant before giving it to the next process. 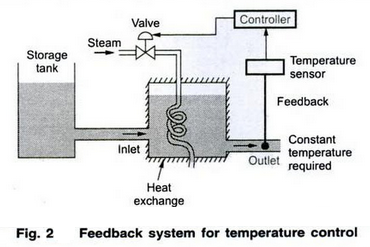 For this a general temperature control feedback system is used as shown in the Fig.2. Practically if the rate of flow of metal from tank to heat exchanger gets disturbed, due to change in level then the temperature gets affected. But it takes a long time to see its effect at the output to take the corrective action. Note : In feedback system, the corrective action can not be taken unless and until output gets disturbed. 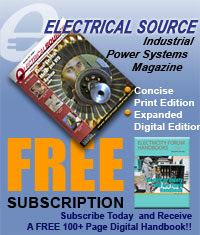 Due to the time lag, it is not possible to keep the output temperature constant within limits. In such a case, feed forward system is used. The inlet flow rate is measured with the flowmeter. Immediately when there is a change in rate of flow, it is indicated to the controller through flowmeter before it is going to disturb the output. The controller takes the corrective action in advance by adjusting the steam flow. Thus the output temperature gets maintained constant within the limits. Note : the feed forward compensation, compensates the effect of disturbance before it actually disturbs the output. The systems is shown in the Fig. 3(a) while its block diagram representation is shown in the Fig. 3(b). The feed forward minimizes the transient error due to measurable disturbances. While feedback compensates for unmeasurable disturbances and other effects. Thus it is advisable to incorporate both feedback and feed forward schemes in a system.